A statue commemorates, Australian Rules footballer, Ted Whitten. 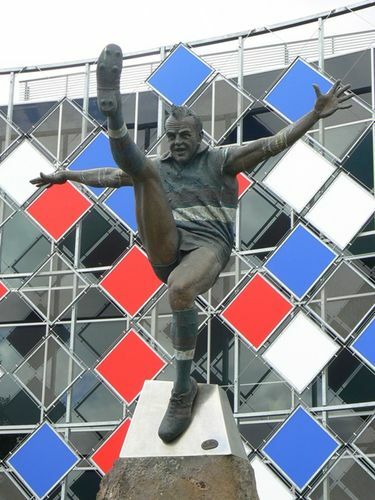 The statue was erected for his outstanding service to football and the Footscray Football Club. The Sunshine Sports Club raised $75,000 to commission the statue. Ted Whitten was chosen by the Footscray Football Club as its player to be included on the inside of the Footscray Stamp Booklet. He was a Centre Half Back/ Centre Half Forward who played 321 games for Footscray, kicking 364 goals between 1951 and 1970. He won Footscray`s Best and Fairest on four occasions. He coached Footscray from 1957-66 and 1969-71. As a player he participated in their 1954 premiership under Captain-Coach Charlie Sutton. Because of his extraordinary skill and all round ability he was dubbed Mr Football by Ron Barrassi, another Legend of the Game. Mr Football was named at Centre Half Back in the Team of the Century named during the Centenary Season.